Now, it is plain for all to see that this council administration does in fact intend to demolish thousands of local council homes and leave many people will little choice but to move out of the Borough. H&F Conservatives now argue that this is a “regeneration scheme” that will be much better for the current residents. If that is in any way true we should expect to see them carry out a vote of the residents whose homes are to be demolished. But I’m willing to bet that won’t happen. Even our Conservatives don’t yet appear to have started believing their own propaganda. 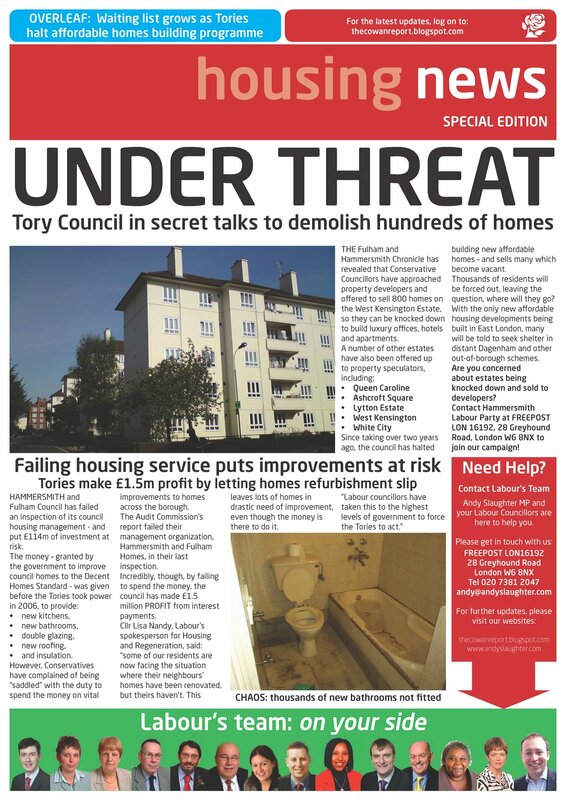 Meanwhile, on 18th April the Conservative cabinet gave its unanimous support to selling off many council homes instead of re-letting them to people on the housing waiting list which is detailed in this report. If you’re trying to square the circle and work out where all our council house residents will go then the obvious answer is these policies mean many won't all be able to stay in this Borough. Indeed, now that rents have been hiked up to "near market levels", large numbers of residents of social housing will have no option but to leave Hammersmith and Fulham for cheaper shelter elsewhere. Combine that exodus with those leaving because of a similarly harsh approach taken to Local Housing Allowances and our Borough begins to have a very different population is a relatively short space of time.